Those whose preferences lean toward the spicy will love this salad. Adjust the heat by increasing or decreasing the amount of jalapeño and chipotle chile. Remove 1 chipotle chile from can. Chop chile to measure 2 teaspoons. Reserve remaining chiles and adobo sauce for another use. Place potatoes in a saucepan, and cover with water. Bring to a boil. Reduce heat; simmer 10 minutes or until tender. Drain; cool. Cut potatoes into 1/4-inch cubes. Place potatoes in a large bowl. Heat a large nonstick skillet coated with cooking spray over medium-high heat. Add corn; sauté 5 minutes or until lightly browned. Add corn, celery, and next 5 ingredients (celery through jalapeño) to potatoes; toss gently. Combine 2 teaspoons chopped chipotle chile, lime juice, salt, and black pepper, stirring with a whisk. Drizzle the lime juice mixture over potato mixture, and toss gently. Cover and chill 1 to 24 hours. Love this recipe! Perfect for summer and don’t have to worry about spoiling at a picnic or potluck! I love this salad as I am from Finland and used to eat potatos every day. 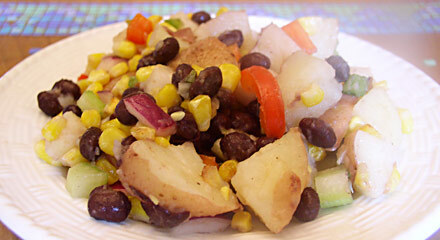 I left out the beans and made a different bean dish as I am not very fond of mixing them with potatoes.